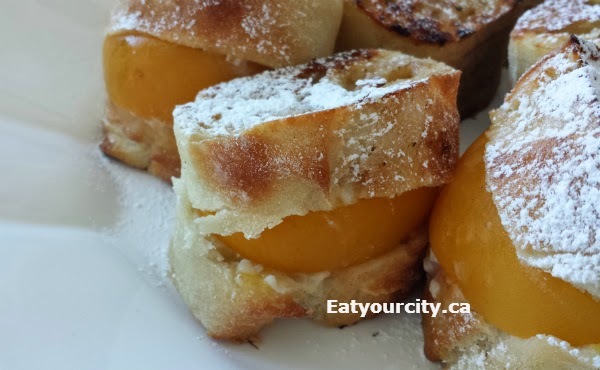 And now its time to have French Toast... but lets up the decadence level a bit and make these over the top stuffed French Toasts that are super easy to make, decadent and looks like you spent loads of time making them! 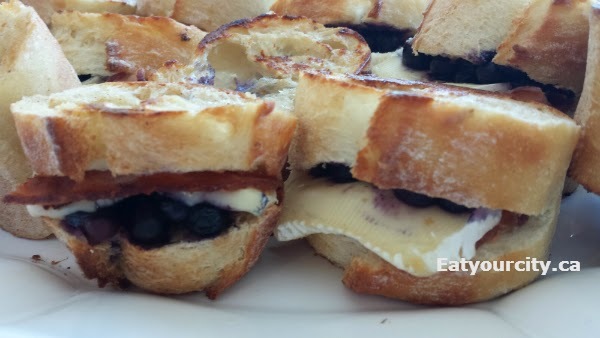 You can make dessert like stuffed French toasts with fruit or savory ones like bacon brie and blueberries.. the possibilities are endless! Next up, for the sweet dessert like stuffed French Toast, I creamed some softened cream cheese with a little bit of sugar, jam (I had apricot jam) and crammed it into the bread opening along with a wedge of peach. You can use fresh, frozen or canned fruit as they're getting cooked a bit so the fruit will soften and get tasty awesome either way! 12 slices of cheese: brie, cheddar, gouda, mozzarella... whatever you like! Sweet stuffed French Toast - In a medium bowl, cream the cream cheese, sugar and jam together until smooth (if its a few lumps, don't worry about it). Add in optional ingredients if you like. Fill the bread pieces with about 1 heaping teaspoon of the cream cheese mixture each and then cram in fruit. 5) You'll be cooking the French Toast in 2 or 3 batches depending on the size of your non-stick frying pan. On med-low heat, add in the butter/oil mixture to a large non-stick frying pan (1 Tbsp if 3 batches, 1.5 Tbsp if 2 batches). Cook the stuffed bread pieces for 2-3 min/side or until golden brown. 6) Sieve icing sugar over the French Toast if you like and dig in!